While we all know that doctors and nurses have the ability to draw blood themselves, phlebotomists are specialized in this area and are experts at obtaining blood specimens. In fact, some phlebotomists can draw blood painlessly. Most likely, you will complete your first venipuncture on a phlebotomy training arm. 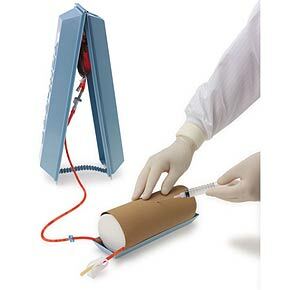 This innovative device is used to teach phlebotomists how to draw blood from a vein. The arm offers phlebotomists a way to get a feel for the texture, density and shape of the skin and veins. This is a great way to practice venipuncture without having to stick someone else. Some schools choose to have a more expensive, advanced training arms that all the students take turns using; whereas, others choose a less advanced, inexpensive arm that allows each student to have her own. One of the least expensive models is the Veni-Dot Training Arm. It offers two vein sizes. A certified phlebotomist designed The Veni-Dot Training Arm. It realistically simulates the density and texture of an actual arm. It can be used repeatedly. One of the more difficult tasks that a phlebotomist will encounter is drawing blood from a newborn. There is also an infant training model available for phlebotomists to practice on. This model is an anatomically correct infant called Nita Newborn™. This life-like model has realistic wall thickness and vein size. It has veins in its arms, right leg and head. These areas are constructed with a latex-free material that offers 50 percent less needle drag. This model can also be used to teach nurses and doctors various infant-specific procedures. When you access a vein, you will feel a pop as the needle enters it. You will then receive a realistic flow of simulated blood that confirms you have placed the needle in the vein properly. When a venipuncture is not necessary, a heel stick is typically used to obtain blood from an infant. This is another procedure that a phlebotomist must be able to complete properly. The blood may be unusable if a specific procedure is not adhered to. There is an infant Heel Stick Simulator available to help phlebotomists learn the proper heel stick procedure. Having this simulator to practice on builds confidence and adds to a phlebotomist’s skill level. The heel stick simulator costs around $20 for a 3/pack and is meant for demonstration purposes. It does not use simulated blood. The Pediatric Training Arm is the exact reproduction of the arm of a six-year-old. It offers a realistic size and feel to provide phlebotomists with an excellent tool for training. The Pediatric Training Arm costs about $500. This advanced arm has an extensive eight-line vascular system. This vascular system offers phlebotomy students the primary and secondary venipuncture locations to practice with. This arm looks, feels and even moves like a real patient. You can develop your manipulation skills because of the flexion at the wrist. The skin will roll as the you palpate the veins and a pop is felt when entering a vein during practice. This model has 10 veins for you to choose from, a deltoid muscle and an intradermal injection sites. These products are a great way to learn the art of phlebotomy. By following the hyperlinks on this page, you will find all of these products available for purchase. When purchasing a training arm or a related product, make sure you get in touch with the seller to verify that your purchase matches the product description (what’s included etc). Links not working? Leave a comment below or contact us. I greatly appreciate your educational articles. I’m a newbie phlebotomist. I work in a Hospital and I’m getting my training there. Do you have any other suggestions or websites to offer a beginner. I’m currently feeling overwhelmed and the people training me are getting annoyed with me. There is a lot more to it than I originally thought. How will I ever remember all those test? I was told it gets easier, but I’m beginning to wonder if it will. I’ve only been doing this for a month and I have almost 100 successful draws. 🙂 I’m desperate for any advice you have to offer.